On the last day in Iceland before heading to Maastricht for TEDx, I had a chance to visit the Harpa concert hall and conference center in Reykjavik. This is a marvelous structure, wrapped in an assortment of glass shapes and colors that look different from every angle and at every time of day. 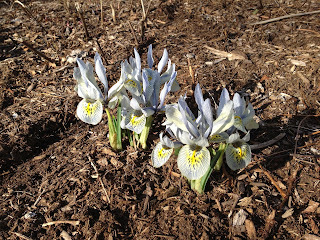 I have posted a collection of views on my Facebook page, but in the meantime, check out these photos. These are all taken from the same location on a sunny day as I was lying on a bench looking up at the ceiling, changing my line of sight by just a few degrees to the left and right. When "violent" is not "brutal"
As a soccer referee, you sometimes see things on the pitch that are bad behavior, and you are given the tools in the Laws of the Game to deal with them. For example, we are advised that striking should normally be considered misconduct -- violent conduct or serious foul play -- "of the gravest sort requiring a send-off and display of the red card." But such characterizations have to be viewed in the context that this is a game. When they are splayed in the media and the same or similar words are used, there is a danger of overstatement. I want to provide an example that is getting a lot of publicity. At a high school game in South Carolina, a player tripped an opponent. The opponent immediately got up and starting striking the other player. Her response was clearly beyond reason. The referee properly ejected her from the game. But now let's view the press coverage. The reporters have ginned up the incident to the point that you would think a crime may have been committed. The television station calls it an "attack". They note that "Sheriff county deputies have been called in." The mother of the other girl wants her prosecuted to the fullest extent of the law. I was surprised, too, that the referee allowed himself to be interviewed by the television station. His job is to file a report with the league, where any required follow-on investigation would take place. It is not right for him to comment publicly on what happened. It would more appropriate for him to say something like, "I am not permitted to comment on this incident. I will file a full report with the league, as I would with any ejection." Even then, you do this in writing and not in front of a camera. You don't go further than that because you never know how your comments will be edited by the media. You are also still emotionally involved in the play, and there is always a danger of misstatement. I hate to say it this way, but people -- even referees -- say things in front of a television camera in a different manner than they might in the calm privacy of their home or during an investigation. You get egged on by an aggressive reporter, and the next thing you know, you use a word or phrase that they edit to appeal to the television audience. Here, for example, the referee uses the word "pummeling" on television. Maybe that's the right word, and maybe it is not. Clearly the girl had acted improperly, but my point is that the presence of a television camera in the face of an inexperienced interviewee often results in something that supports the "drama" that the television station wants to present. Why this story about a teenage girl should be on television at all is problematic. She made a mistake on the playing field, and now her image has gone viral worldwide. Cameron Smith, over at Yahoo! Prep Rally, actually goes so far as to say that the incident was "brutal." He compares the case to that of New Mexico defender Elizabeth Lambert, a college level player, "whose hair pulling and general dirty play in a game against BYU received massive Internet attention and eventually landed her a lengthy suspension. One could argue that Lambert's fouls may have been worse because she was more level-headed when committing them, but they certainly weren't as violent as McCullough's attack." What tripe. Oh, please. The South Carolina girl made a mistake during a game. Let her parents and coach deal with the offense and help her and the other girls learn from it. Ali, aged 14, looked like Li’l Orphan Annie. Short, with a head full of curly red hair and freckles, she was refereeing a game of 12-year-old players. One of the coaches, a large middle-aged man, was persis­tently and angrily yelling from the sidelines about the calls she was making. Abashed, he reddened, apologized, and was calm for the rest of the game. Midway through the first half, a coach challenged the referee on an out-of-bounds call. It was a surprisingly loud outburst given that 1) the ball didn't cross the line entirely; 2) even if it had crossed the line, it was close enough that any reasonable coach or player would have given the referee the benefit of doubt; 3) nothing significant happened as a result of the call; and 4) this was a friendly match that had no bearing on the standings, playoffs, etc. The coach yelled at the official for a good 10 seconds. The referee walked toward the coach and told him in very clear, authoritative way that he needed to be quiet. That seemed to anger the coach further, as he continued to talk at the referee in an animated way. The coach was provoking the referee and daring him. He kept saying something along the lines of, "Go ahead and throw me out; I'll take my team off the floor." The referee calmly said, "I don't want to do that," but the guy wouldn't let it go, so the referee finally accommodated him by ejecting him from the game. OK, all coaches have bad days, and who knows what was behind this incident. And, also, there may have been some other approach the referee could have taken to defuse the situation. But here's the truly sad part. In leaving, the coach also took the boys with him. He deprived them and the other team of the pleasure of playing their game. Not satisfied with this, though, he also withdrew from the league several other teams of younger children that he was coaching or managing. In so doing, he deprived them all of the chance to compete in the end-of-season playoffs. One team of younger players found out they were not playing only when they arrived in the gym. They were told to go home. I have learned over the years to try to look past a person's behavior on a particular day, to appreciate his or her contributions on many other days. This coach has been an exemplary teacher for the boys and loyal to them. He has many years ahead in which he will make many contributions to their development as players and young men. How he chooses to present this story, though, provides a new kind of challenge. I am confident that if he does so with true regret and humility, and as a learning experience for the boys, he will find even stronger support from them and their families. I have written before about the Nes artist residency program in this small Icelandic town of Skagaströnd. The variety of people who attend, in terms of geographic origin and media, is really amazing. Today, I met a Norwegian artist, Merete Røstad, who specializes in the creation of art in public places. She describes this as "process-based practice utilizing public space as a common place, where art practice is able to create an open dialogue in collaboration with its citizens." She has been commissioned by the Norwegian government to prepare work commemorating the forthcoming (2014) two hundredth anniversary of the Norwegian constitution. Her concept is to produce a "Vocabulary of Thought." Assisted by a linguist, she will take words that tend to be associated with the constitution and illustrate each one with an artistic presentation. Because she believes in public art, the book will be available to all on the web. Here's one of the pages from her research. She already taught me a new word, galimatias. The etymology is given as France in the 1600's. I think, though, that might be an error, instead being derived from recent Congressional debate in the US. A note again from Iceland, where I am staying over en route to TEDx in Maastricht next week. One thing that is pervasive in this stark country is wind. Here's the wind speed map from the past couple of days in my area. 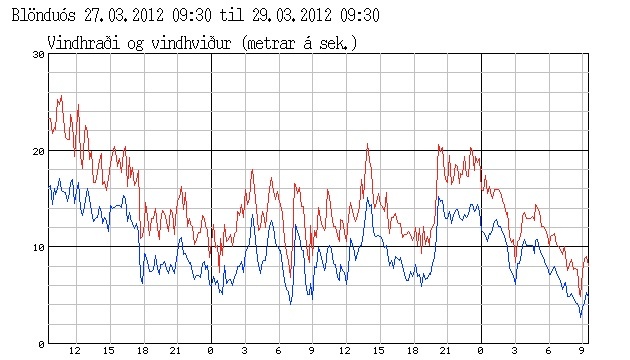 It is presented in meters per second, with the bottom line being an average and the top line the peak gusts. 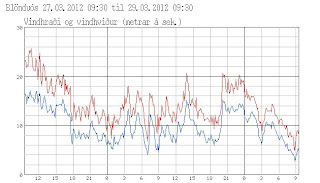 Around the time I was taking a walk, the gusts were hitting 26m/sec. That's 58 miles per hour. On the Beaufort scale, that is equivalent to "storm," well beyond a "gale" that "generally impedes progress." It sure changes the nature of a nice walk along the cliffs. In fact, you have to avoid the cliff edge, as people have been known to have been blown off them here. What on earth does Rock Hudson have to do with a fortune teller from a small town in northwest Iceland? Well, "Back to God's Country" was the first movie shown in the then new (1959) community center in this town, a reclaimed Quonset hut that had been moved from another town. Here's a picture of the rapt audience at that time. the first named inhabitant of Skagaströnd, who lived there in the late 10th century. The exhibition features all kinds of interesting information about prophecies and fortune telling. Visitors can have their fortunes told and their palms read on request. Children can examine Þórdís’s gold chest, where various interesting things are hidden. How much is myth and how much is true about Þordís is left to your imagination. As I heard Dagny, one of the founders of the museum explain it, though, I sensed that a lot was true. (In case you are wondering, I am here en route to Holland to participate in TEDx in Maastricht on April 2.) Þordís trekked from the other side of the peninsula and arrived at what is now Skagaströnd to escape a repressed lifestyle and to have the freedom to live as she wanted. When she saw the mountain now know as Spákonufell (fortune teller's mountain), she said, "This is the place" and began farming and prophesizing. (See frieze to the left.) From there her story is intertwined in many ways with the Icelandic Sagas, a remarkable collection of folk tales, myths, and history. A good amount of magic is involved, including spells and enchantments. Answer me dear vala the questions I will ask. At this point, the vala is dropped. If it lands with the convex side up, the answer is "yes." If it lands with the convex side down, the answer is "no." If it lands on its side, you are left without an answer, either because it does not know or does not want to bother giving you an answer. Þordís eventually met her demise after a dispute with a priest about sheep grazing. After warning him several times, she used a rock to kill one of his sheep that was on her property. He got revenge by causing her to be buried in an avalanche of rocks that fell down from her beloved mountain. Since she was a fortune teller, she knew this would happen to her and prepared for her death by hiding her case of gold and jewels somewhere on the mountain. By her proclamation, it can only be found by a non-baptized woman who is brought up drinking horse milk. To date, that woman has not shown up to find the treasure. But reportedly, Þordís lies calmly in wait, now as a physical part of the Spákonufell. The Division of Health Care Finance and Policy is about to appoint people to a very important advisory group, the mellifluously entitled "Data Release Committee for the All-Payer Claims Database (APCD)." You may recall my post about this data base. It comprises medical claims, dental claims, pharmacy claims, and information from member eligibility files, provider files, and product files. It includes fully-insured, self-insured, Medicare, and Medicaid data and clear definitions of insurance coverage (covered services, group size, premiums, co-pays, deductibles) and carrier-supplied provider directories. Its collection is potentially one of the most important acts by the Massachusetts state government, but only if the data collected are made broadly available. The work of the Data Release Committee will be guided by regulation 114.5 CMR 22.00: Health Care Claims Data Release, which governs the procedures and criteria by which DHCFP will grant access to qualified applicants for the APCD. The Data Release Committee will implement these regulations by advising the Commissioner on both general best practices regarding claims data release and the determinations regarding individual data release applications. The Data Release Committee is expected to meet 1-2 hours a month; Committee members will be expected to contribute additional time outside the meetings to support the functions of the Committee. Please submit your nomination to Christina Wu, Division of Health Care Finance and Policy, Two Boylston Street, Boston, MA 02116, or by email to Christina.Wu2@MassMail.State.MA.US no later than close of business Monday, April 9, 2012. How about an ad about prevention instead? Girls are 5-8 times more likely to suffer an ACL tear playing sports. Children's Sports Medicine experts will get your daughter off the sidelines and back in the game. Experience the pediatric difference at Children's Hospital.org/acl. I have a deep and abiding affection for Children's Hospital, but this ad struck me as wrong-headed. I know they mean that they will take good care of your daughter -- and indeed they will -- but this felt like an ad that was playing to the prejudices of those overly ambitious parents I often see on the sidelines of suburban soccer games. You know, the ones who think their daughters are above average and will someday qualify for athletic scholarships if they just push them enough. The ad made me feel like the job of the hospital was equivalent to that of the medics in the military (or trainers in the National Football League! ): "Patch up that soldier as soon as possible to send him back to the front." There was no expression of empathy towards the child. Only 1-2 percent of soccer programs in the United States use these injury prevention programs. What can be done to encourage more programs to participate? It’s largely a question of getting the word out there. Many people haven’t heard of an ACL injury until they have one. . . . Getting the message out that these programs are available and can be performed often with little or no special equipment could help a great deal. Several local physical therapy groups that specialize in adolescent athletes also offer teaching of these injury prevention programs for teams and individual athletes. I understand the commercial pressures on hospitals and the desire of marketing departments to advertise revenue-producing services. But why not use this portion of the advertising budget to help "get the word out there" about injury prevention? What if the ad were something like this? Girls are 5-8 times more likely to suffer an ACL tear playing sports. Children's Sports Medicine has ideas about injury prevention that will keep your daughter in the game and off the sidelines. Experience the pediatric difference at Children's Hospital.org/acl. Listeners would still be reminded of the hospital's expertise, but at least we would get a message that I believe reflects the values of the institution, that the folks at the hospital would prefer not to have treat children for this kind of injury. It is almost a year since I have reported on activities from my young friend Alissa Caron in Cambodia. Recall that she is the in-country coordinator of a new, integrated rural health and development program outside of Siem Reap, Cambodia. 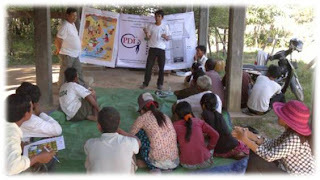 Her organization is Population and Development International – Cambodia. Having visited with Alissa on one of her short trips home a few months ago, I am tremendously impressed with her sense of initiative, but also with the modesty and cultural understanding she brings to her job. The PDI-C team is working so hard day in and day out to build a sustainable partnership with the villagers, and we’re starting to see some great results! The villagers have learned how to manage community banking (personal savings and borrowing loans for small business activities) on their own, have started to improve their health-seeking behavior through an intensive community-based health education program facilitated by our partner Angkor Hospital for Children, have developed new agricultural and vocational skills, and most importantly have created strong bonds with each other that hopefully will last for years to come. Until this month, our project was working with 6 villages, but this month we’ve expanded to 7 more (including 4 in a new sub-district) so we’ve effectively doubled our target population and are starting the cycle anew. Croation? How about we pick English? First, every time he goes to a new hospital he has to learn that hospital's variation of IT - even if they are using the same vendor, such as Epic. Also, it takes him much longer to document stuff in the computer than it did on paper. Third, the systems are constructed to satisfy Medicare rules and meaningful use requirements, so the doctor finds himself having to ask each patient if s/he has ever smoked, even though he doesn't care from his specialty's point of view. Never mind that, in a proper record, the answer would already be there! The funniest thing he said was he has to ask each patient in what language s/he would prefer to conduct the visit. One lady answered, "Croatian." The doctor said, "That's not on the list. How about we pick English?" Andy Oram from O'Reilly Communications offers some thoughtful observations in this post, entitled, "Five tough lessons I had to learn about health care." 5. Patients don't want to be care managers. Although doctors eschew case management, there are plenty of other professionals who can help them with it, and forming Accountable Care Organizations gives the treatment staff access to such help. Tons of potential savings lie in the data that clinicians could collect and aggregate. . . . ACOs and other large institutions can hire people who love to crunch big data . . . to create systems that slide seamlessly into clinical decision support and provide guidelines for better treatment, as well as handle the clinic's logistics better. So what we need to do is train a lot more experts in big data to understand the health care field and crunch its numbers. This is a good point. Unless health care organizations understand enough about their patients to create decision support mechanisms, there will be a tendency towards anecdotal biases in diagnosing and treating patients. I would go further than Andy, though, and put his recommendation in the category of necessary but not sufficient. As Brent James, Lucien Leape, and others have made clear, physicians need to be trained in applying the scientific method to the field of care delivery -- just as they now apply it to basic research. Generally accepted protocols must be adopted, against which experiments in care improvement can be measured. Doctors must be trained in this expertise, so that the data analysis capability Andy Oram persuasively explains to be within reach can be applied. Procedural specialists – the people who do things to you like surgery, endoscopies, and catheterizations -- have more influence on this panel. Therefore, the process results in greater values being ascribed to the procedures than to cognitive services – the doctors who take histories, listen to you, evaluate symptoms, and make recommendation. And greater value translates into higher payment rates for those proceduralists. Payment levels are skewed away from cognitive specialists, like primary care doctors (PCPs). We need to ask the question: What if the system were changed? What if primary care doctors were paid more? It turns out that this would save money for American consumers. Why? We all know about the way things are today. When you go to your primary care doctor, the appointment is often rushed, 20 minutes or less. This is because those PCPs get paid very little per visit and therefore have to squeeze in many appointments each day. In many ways, the PCP ends up being just a triage stop along the way to referring you to a specialist. It would make more sense if the PCP could have the time to engage in "old-fashioned doctoring." Then the doctor talks, listens, probes, and uses his or her cognitive skills to figure out what's wrong with you and what might be done about it. Now, I am not suggesting that surgeons and others are not important to medical care. But one can certainly make a case that a PCP’s evaluation can make a significant difference in the course of treatment of a patient. Indeed, this doctor’s diagnostic skills can often obviate the risk, cost, and disruption of interventional procedures. So, the idea is that if PCPs could afford to spend more time with patients, many treatments and tests that are currently done by specialists could be avoided. How can we test this proposition? Well, a recent study by the Commonwealth Fund did just that. The Commonwealth Fund study does not cover private insurance plans, but it is reasonable to extrapolate the result from their Medicare analysis to those employer-based plans as well. Some people in Massachusetts believe that the best way to increase income for primary care doctors is to establish a system of “global payments.” Under this form of capitation, there would be the equivalent of an annual budget for each patient’s health care costs – covering everything from primary care through surgery treatment to rehabilitation. If a health care network were able to take care of patients for less than this annual budget, it would get to keep the surplus. A portion of that surplus could then be redistributed back to PCPs for their role in helping to manage the patients’ care. Would this work? To date it is unproven. Also, the issue of how the surplus would be shared among all types of doctors is, as you can imagine, not a slam dunk guarantee for the PCPs. Instead of relying on what might be mythical savings, why don’t we just get it done the right way? Increase what we pay PCPs, reap the savings, and improve care for the people of the Commonwealth. Governor Deval Patrick's FY2013 state budget proposal includes $40 million in rate cuts for hospitals. A significant portion of these cuts would be made through highly questionable policy changes. One of the more troubling policies would double penalties on hospitals for re-admissions that occurred in 2010. The 2012 MassHealth acute hospital RFA – the main contract between the state and hospitals serving Medicaid patients -- introduced a new preventable readmission penalty for hospitals that MassHealth determined had higher-than-expected preventable readmission rates. Even if the readmission rate is the right metric to use for comparison purposes, we don't have a model that would accurately compare one hospital to the others. This suggests that the time is not ripe to use this measure for financial incentives or penalties. It might give the impression of precision, but it is not, in fact, analytically rigorous enough for regulatory purposes. Given that many poor-performing hospitals also have fewer resources, they may suffer disproportionately from financial penalties for high readmission rates. As we seek to improve care for patients with heart failure, we should ensure that penalties for poor performance do not worsen disparities in quality of care. The National Quality Forum and the state's own Expert Panel on Performance Measurement had both previously rejected the measure that MassHealth used to impose its penalties. MassHealth already has a Serious Reportable Event (SRE) policy that prohibits payments to providers when a readmission can be traced unambiguously to hospital care failures. There are many other instances, however, when a readmission has nothing to do with the care initially provided at the hospital. Responsibility and accountability for readmissions, as with most patient health issues, is shared among hospitals, ambulatory care providers, long-term care/post-acute care institutions, public and private payers (including MassHealth), patients themselves, and patients' families. I know from my work with many MHA members that the hospitals in the state have been diligent in trying to work internally and with others along the spectrum of care to lower preventable hospital readmissions. I think they are correct to oppose this flawed penalty the administration has proposed. It now falls to the Legislature to reject the idea. Sadie Wolfe wins the contest! Sadie Wolfe, age 11, from Wisconsin, is the first winner in my new contest. Check this blog post to see her poem describing her favorite coach! As I prepare to be part of TEDx in Maastricht on April 2, with some follow-on sessions at Radboud University Nijmegen Medical Centre, I am reminded of the important World War II battle that took place at nearby Arnhem, depicted in the movie A Bridge Too Far. The movie documents a number of organizational problems among the Allied forces that could have led to disaster. The military leaders engage in the worse form of groupthink and, like doctors who are trapped by diagnostic anchoring, chose to believe only the evidence that supports their conclusions, notwithstanding evidence to the contrary. They also suffer from the kind of hierarchical communications failure that we often see in hospitals, the sort that Crew Resource Management has been shown to forestall. The Germans, expecting the invasion to be led by tank-master general Patton, decide to "rest" their major tank battalion in Arnhem. The British and Americans are convinced that the German force is very weak in that location -- just "Hitler youth or old men" -- notwithstanding reports from the Dutch Underground that the area is heavily reinforced and commanded by a senior German general. The Allies plan on dropping paratroopers eight miles (!) from the bridge in Arnhem, which they will get to and then hold until reinforcements arrive. A young English intelligence officer, Major Fuller, is worried and gets permission to send in a low-altitude survey flight, which takes pictures of the tanks. In this segment of the movie (starting at 6:31), his commanding officer, General Browning, refuses to believe the evidence, notwithstanding visual proof supporting the Underground's reports. Among other things, he doesn't want to be the one to tell Field Marshall Montgomery that the attack should be called off. In an earlier segment, too, British officers conclude that the portable radios given to the paratroopers are not likely to work for the long distance from the drop zone to the Arnhem bridge amid the water and trees of the Netherlands. The officers choose not to rock the boat and do not convey their concerns up the chain of command. Luckily this all turned out all right, if you ignore the wasted human lives that resulted from all these miscalculations and miscommunications. In war, it seems, as in hospitals, the reaction is often "these things happen." But as documented in this movie, they don't have to. The House voted 198-161 yesterday to let for-profit specialty hospitals build in New Hampshire without undergoing the rigorous state review required of other hospitals. The bill also gives those hospitals a possible exemption from a Medicaid tax other hospitals pay. House Majority Leader D.J. Bettencourt of Salem, one of the bill's co-sponsors, said it would bring jobs to the state by making it easier for hospitals to come to New Hampshire. Opponents like Rep. Rich DePentima, a Portsmouth Democrat, argued against the legislation, saying it would increase health care costs. Specialty hospitals take only insured or wealthy patients, he said, leaving the community hospitals with patients who are underinsured or covered by Medicaid. The bill also says 65 percent of a specialty hospital's patients would have to come from out of state. That requirement is intended to prevent the specialty hospitals from "cherry picking" too many in-state patients, the bill's supporters said. DePentima questioned that assurance because there is no penalty in the bill for a hospital that violates the 65 percent threshold. "This is like a stop sign in Italy," he said. "It is just a suggestion." The bill now moves to the Senate. It should be fascinating to see how the "live free or die" state resolves this issue. Don't forget to remind your 11- to 14-year-olds to finish their essays or poems for the contest I announced earlier in the week. My favorite coach ever is or was [name]. Let me tell you why. The deadline for entries is today, March 24 at 9pm Eastern Daylight Time. Please see my earlier post for all the rules. The two winning entries -- one from a girl and one from a boy -- will be posted on my companion blog, Goal Play!, for the world to read. In addition, I will make a personal contribution of $50 each to a sports-related or education-related non-profit designated by each the two winners. But what you might not realize is that scientists suffer from verbal fads as well as substantive ones. When I first arrived to work at Harvard Medical School in 1998, you could barely get through a meeting without someone talking about the need to "interdigitate" knowledge from one field with another. Of course, that was anathema to a department-based research institution, especially where academic promotions were based on super-subspecialty reductionist science. Nonetheless, people would always respond by saying how that "resonated" with them. Then, they would leave the room, and nothing would change. The current verbal fad among scientists is the use of the word "so" when starting a sentence. So let me give you a little bit of background. So social scientists have known for a long time that when you ask people their views on policy questions, they are influenced by the identities that they share or don't share with political leaders. So if you're president shares your religion or your gender or race, you're much more likely to find the president's policies something that you can support. If you don't share the identity of your president, then you're much more likely to find yourself in opposition to the president. So I'm looking at a specific study that was just published in the American Journal of Political Science. So that's an excellent question, Steve. Next time you are at a scientific conference or meeting, keep your ears open for this little conceit. Or better yet, don't, as it will drive you crazy after a few minutes. Some companies arise out of personal travails. As I continue my occasional series about local health care entrepreneurs, I want to report on one such case, Muscle Angel Massagers. The company came about because Susan Robins had such bad tendonitis that she could not even lift a pencil to write or turn a key in a door, much less play her beloved cello with the Longwood Symphony. She needed a therapeutic device that she could use anywhere, hands free, and requiring no electricity. No engineer by training, she nonetheless designed and figured out how to fabricate this handy tool. It turns out that you can use it for all kinds of injuries and rehabilitation, from strained IT bands to lower back pain, to jaw pain, to plantar fasciitis. Athletes and "normal people" have found it to be great for their strains and aches. And here is a video of "advanced techniques" for injured athletes, dancers, and the like. The product is available on Amazon and at a growing number of retailers, health clubs, and spas. I don't want you to think I am picking on Delta Airlines, but they have adopted the all-to-common corporate approach of answering the question they want to answer, rather than addressing a customer's concerns and questions. There are frightening parallels to the experience of patients in many hospitals. I have outlined the saga of my round-trip flight to New York City. I was using a frequent flier award coupon and simply wanted to change my return from the 3:30 flight to the 2:30 flight, as I was able to get to LGA a bit early. When I forwarded the story to the corporate suggestion and complaint website, I first received a semi-computerized reply that indicated they had not read my first note. I appreciate the opportunity to explain our Same Day Confirmed travel program which allows customers to be confirmed on an alternate flight (from and to the same ticketed origin and destination) on the same day as ticketed, within three hours from the scheduled departure time of the requested flight. Please note the Same Day Confirmed option is only applicable Delta-operated flights including DL Shuttle and DL Connection flights within the 50 United States, Canada, Puerto Rico and the U.S. Virgin Islands. Further, the Same Day Confirmed option was added to allow customers the opportunity to change their flight on the same day without being charged the normal $150 administrative penalty associated with their non-refundable ticket. Rather, a $50 fee is charged for the change. Respectfully, the $50 fee assessed was correct and no refund would be due. While I understand the flight was rather empty, the Same Day Confirmed program is already offering a discount to the administrative fees agreed upon at the time the ticket was purchased . Thanks, I was not asking for a confirmed flight change. In essence, I was asking to fly as a stand-by passenger. Why there should be any fee for that -- in general -- is not clear to me. It causes no extra cost for you as an airline, and it offers a convenience for a loyal customer. Mr. Levy, thank you for your additional feedback regarding your desire to try and standby for an earlier flight instead of utilize the Same Day Confirmed option. Regrettably, we do only allow Diamond, Platinum, and Gold Medallion members traveling without checked baggage to standby on a flight where they are unable to use the Same Day Confirmed program. The rules for this option are very restrictive since standby does not guarantee that seats will be available on any portion of the standby request from the origin or connection city. Again, we will not allow a passenger with checked baggage to participate and due to the difficulties with receiving a seat; and we do restrict this option to our Medallion members. I showed up at LGA with no luggage, a confirmed seat on the 3:30 flight, and simply asked to take the 2:30 flight, which was very empty. Why wouldn't you want to give your gate agent the discretion to allow me to make the switch? By the way, on the morning flight from BOS to LGA, I was permitted to do exactly that. I was booked on the 9:30 shuttle but arrived early at Logan. The desk clerk told me to go to the gate and ask to be allowed on the 8:30 flight. It was done with no fuss, even though that plane was considerably more full than the 2:30. It is when your rules make no sense that you really leave us as customers at sea. They imply a lack of trust in me as a passenger. It is as though you think I was trying to manipulate the use of my award travel to carry out a dastardly deed, to leave LGA an hour earlier! The deadline for entries is Saturday, March 24 at 9pm Eastern Daylight Time. Please see my earlier post for all the rules. Our aim is 100%. Short of that, we are at zero. Our dashboard is set up for perfection--all or nothing. So we are either 100% or 0. We have added the word "never" within each indicator so that we can measure 100%. "100%" means we had zero incidents that month for that indicator. Wherever you see a "0" we had a failed case or event that month. 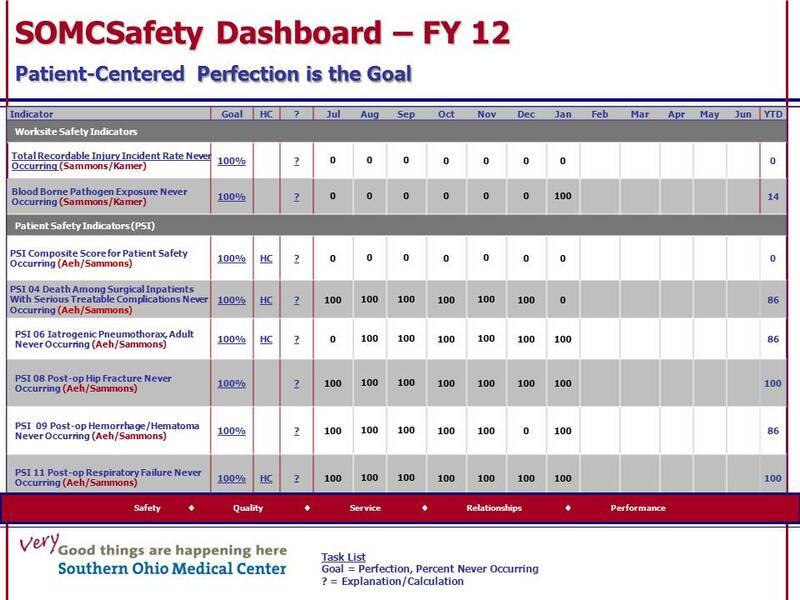 So the key is to create a dashboard that reflects your hospital's audacious goals, that is broadly visible to everyone, and that works to focus the efforts of your medical staff on the priorities they have identified. 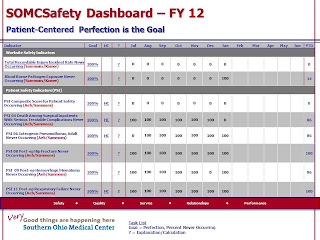 By the way, the dashboard will change over time, with redesign resulting from the communal learning that occurs in your hospital. Don't worry if some metrics drop off and others are added. Don't worry if you change how you keep track of things. Such changes are the sign of modesty and learning. But you need to get started. Now. People's lives hang in the balance. Where do new ideas for how to improve health care come from? Sometimes they start with a hunch or an expressed need from health care providers; sometimes they’re unearthed by deciding to make a dramatic reduction in mortality in a resource-poor setting or by drawing a line in the sand on the wasteful practices of fee-for-service medicine. Whatever the motivation or source – whether a hunch or a need or a challenge – even the best-sounding new improvement ideas need careful vetting and scrutiny and, if appropriate, a well-designed test to determine if an innovative approach to better patient care can make a difference in an actual health care setting. Not every new idea flourishes, but chances are it’ll die on the vine without an effective and efficient way to determine its potential contribution. This, in a nutshell, is the rationale behind IHI’s 90-Day Research and Development Process. Now in its sixth year – and its 23rd 90-day wave of putting innovative ideas through a disciplined, evaluation pipeline – IHI’s R&D process has had its share of wins: improvement “bundles”, the Global Trigger Tool, the optimal elements of best stroke care, the early thinking and widely disseminated framework of the Triple Aim, and much more. How is it possible to conduct R&D on a “shoestring”? 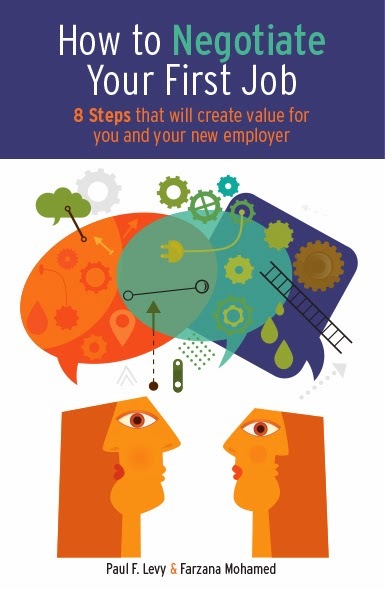 What are the core components, the resources, and the steps necessary for an effective 90-day process? What kinds of innovations has IHI put to the test, which ones generated valuable learning, and, most importantly, what kinds of fresh approaches could your organization use to generate, evaluate, and – when viable – turn into effective improvement processes? On March 22, WIHI host Madge Kaplan welcomes two of the people who have helped shape and nurture IHI’s 90-day R&D process since its inception: Andrea Kabcenell and Lindsay Martin. The two couldn’t be more passionate about the process and possibilities and necessity of R&D. They’ll offer everyone who tunes into the March 22 WIHI both the nuts & bolts and the vision that could become part of your agenda, too. Rounding out the program will be Dr. Bela Patel of The University of Texas Health Science Center and Memorial Hermann Hospital in Houston, Texas. Dr. Patel will explain how she and her team have benefited from one of IHI’s most recent R&D innovations: the Hospital Inpatient Waste Reduction Tool. Dr. Patel will also provide examples of what front line staff can generate if given the opportunity and inspiration to innovate. Please join us! The Columbia Journalism Review has a section called "Darts and Laurels", in which the editors offer short commentary on recent events in journalism, either negative or positive. With full credit and due respect to the CJR, I want to borrow their nomenclature and apply it to three recent columns I have written. We are making changes that we anticipate should resolve the matter. First, we are changing our shuttle bus policies to allow students to carry on covered drink and food containers. Second, we will be communicating closely with our shuttle drivers to help enforce this new policy, in addition to having them remind students to not leave litter behind. Third, students in violation of littering will be subject to disciplinary action. Lastly, we are meeting with our Student Government Association and other student leaders to address other ways to raise awareness and positive action on this issue. I did meet with the manager today and also some of the employees, including those you mention during your visit on Saturday, and we discussed the service expectations at Peet's as well as how to maintain them when situations like the one you had impact the overall environment and a customer's experience. This is especially good, in that I had asked her, please, to avoid punitive action and seek an approach that would create a learning experience for the staff members involved. She made it clear that such an approach was consistent with the company's policies. Thank you for your e-mail to Delta Air Lines and sorry for any inconvenience. We would appreciate you providing additional information which will allow us to process your request. Please provide us with the exact nature of your concern, as your mail does not specify it. While the world at large focuses on the Supreme Court arguments about the national health care law, my neighbors will get to hear a thoughtful discussion hosted by the Newton-Needham Chamber of Commerce on the topic, "What you need to know about cost control, quality and value in health care". The event is on March 28 and features three knowledgeable folks, Dr. Michael Jellinek, President, Newton-Wellesley Hospital; Andrew Dreyfus, CEO of Blue Cross Blue Shield of MA; and Charles Baker, Principal at General Catalyst Partners and former CEO at Harvard Pilgrim Health Care. More information is available at this website. Reported to me by a friend, who accompanied her pregnant friend (6th month) to visit a sick patient today at a Boston area rehab hospital. Having visited before, they first went towards the previously assigned room, and a staff person recognized them, and directed them towards a single room instead of the previous double room. While visiting the patient, at least three staff members came in and engaged in conversation, all making notice of the pregnancy of the visitor. In the course of the visit, the visitors held the hands of the patient. A fourth staff member came by and said, "You know you should really be wearing gowns, as the patient has an extremely contagious intestinal infection." It appears that this may have been the reason the patient was moved to a single room. The visitors left the room, put on robes, and returned. Later the patient informed the visitors that she had C. diff, a very contagious bug. No one on the staff told the guests that C. diff is not killed by the Purell sanitizer, that it takes soap and water cleansing. Fortunately, the guests were aware of that precaution. I haven't found any literature to suggest that pregnant women are especially susceptible to C. diff infections, or that the fetus will get the disease if the mother gets it. I guess there is something to be said for an enforced weight loss (!) from the diarrhea, but I don't think most pregnant women would choose that path to weight control. Also I have read that, if the infection is persistent and antibiotics must be administered to the mother post-partum, it could be inadvisable to breast feed the baby. Given the circumstances, this all seemed to me to represent a very casual approach to infection control. Are there any reactions from doctors and nurses out there? You don't have to speak German to understand this. The woman asks her father if he's figured out how to use the iPad she gave him, which he affirms without question. Winter never came this year, but Spring has arrived! Process improvement in a hospital, company or other organization is a lot like process improvement on a sports team. As I have set forth in my book Goal Play!, the coach has an important role in both settings. I, along with a small group of coaches and referees, will judge the entries, and we will pick a winner from among the girls and another winner from among the boys. The two winning entries will then be posted on my companion blog, Goal Play!, for the world to read. In addition, I will make a personal contribution of $50 each to a sports-related or education-related non-profit designated by each the two winners. I understand that you are running a competition for youth soccer players to comment on the best coach that they have had and why. My daughters were never into soccer and instead choose to pursue other athletic pursuits where they have had their share of great, mediocre and those best un-named types of coaches in their activities. Why can’t they share the best coaching practices that they have seen so that others may hear what works in other youth sports and learn from that? Great idea, Susan. I was being too limited. We’ll open this up to all sports, but let’s still hear only from kids between 11 and 14 years old. We don't think in ounces. We think in pounds. Food matters to patients, and others! Stop smiling. It is not good enough. Don't blame Lean. Learn together from it. She's a thief . . . the foreigner!